Are you disappointed when the only vegetarian or vegan option at a restaurant is a salad and veggies? Here in Gainesville, Florida, we’ve found the perfect solution for this common struggle. Experience big, bold flavors at Civilization in Gainesville, a largely vegetarian restaurant that serves savory international and local dishes. With rotating weekly specials and options for all kinds of food lovers, this inspired cultural cuisine is more than just a happy medium. For other great Gainesville tips, view our Vacation Guide to plan the best vacation yet. Although there are plenty of restaurants in Gainesville, none can compare to the variety and versatility of Civilization. Over the weekend, although you may be filled from a Sweetwater Branch Inn breakfast, you can still stop by the restaurant for a late-morning brunch. From Tuesday to Friday, take your afternoon in Gainesville to indulge in mouth-watering lunch offerings, and Tuesday through Thursday, try their delicious dinners. When you plan your visit, make sure to dine at Civilization on Worldwide Wednesdays. On these days, you can discover authentic international dishes from a country of the chef’s choice. Be as bold as the flavors on your plate and sample some of these worldly meals! Vegans and vegetarians alike will fall in love with this menu. You’ll find tasty traditional salads piled high with fresh toppings as well as other options that showcase how vegan and vegetarian diets can be offered more variety. Take for instance the creativity of their Hispanic-inspired El Vegetariano Enchiladas stuffed with sweet potatoes and rice and finished with a drizzle of homemade chili tomato sauce. Dabble in other international dishes like the Indian Thai Plate consisting of two different curries, or choose from three different Ethiopian dishes for tastes that will diversify your palate. More and more restaurants like Civilization and The Top are striving to provide meals that are satisfying to all. Have no fear: there are plenty of options for protein lovers! From a Moroccan Barbeque Sandwich to traditional burgers made with locally-sourced meats, you can still expect a satisfying meal that showcases international flavor just as well as the veggie-based options. With the goal of providing everyone the equal opportunity to discover the world through food, these delicious items are a must that leave customers with a full and content belly. Just as the cuisine at Civilization in Gainesville transports you to a dream destination, Sweetwater Branch Inn immerses you in a lush oasis in the midst of the bustling city. Amenities like peaceful gardens and a saltwater pool work together to create a sense of relaxation and comfort. You can even experience a trip back in time to the elegant Victorian era when you book a stay in Isadora’s Room. 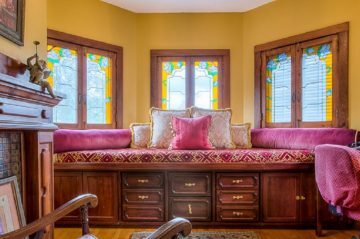 The charming window seat welcomes you to relax as you gaze out of the gorgeous stained glass windows overlooking the soothing greenery below. Book today to begin your journey with Sweetwater Branch Inn.